Why has no one made a Teen Titans "Cyborg" skin for Samus?! Gordon Ramsay Makes It Rustic! Paula Deen Butters Up the Competition! Jiggth is still perfecting its own moves somewhere in lost Dreamcast blueprints. Is there a way to delete my old threads? 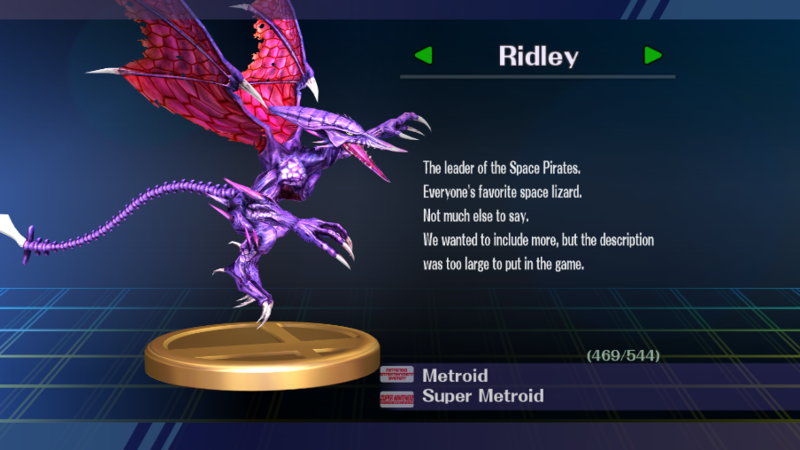 Wonder how many folks put "Ridley" in that Smash Bros fighter's ballot? So we have established we can shatter the game... When are we going to get around to balancing? What is this term, balance? So we have established we can shatter the game When are we going to get around to balancing? I'll see what I can do! Thank you! Happy Birthday! Have a cake and good luck with your training. Ack, just found out I can reply on here instead of hitting your profile! Thank ya kindly, again! Ridley rated T: for Too Big for Smash!